The Gospels tell an incredible story. A virginal conception. Miraculous healings. Even people coming back from the dead. How are we to know that it’s not all just a fanciful fabrication? There is much evidence for the reliability of the Gospels, but here is one of the strongest bits of evidence I know. Think for a minute. If you were part of a group who decided to perpetrate an elaborate hoax, what would be your motive? Wouldn’t you want to gain some significant benefits from such a risky business? Maybe fortune, fame, and privilege? And if you were to be prominent figures in this tall tale, wouldn’t you at least want the story to make you look good? But in the story told by the apostles, virtually all of them look really bad. During Jesus public ministry they repeatedly fail to “get it.” In fact Jesus wears himself out trying to hammer the truth through their thick skulls. After witnessing three years worth of miracles, one of them betrays Jesus and their leader denies him. All but one run away when he’s crucified, and no one believes Mary Magdalene when she brings them the news of his resurrection. But the episode recounted in John 20:19-31 takes the cake. The Risen Christ appears to the twelve on Easter Sunday evening. Or rather, I should say he appeared to the ten. Judas, the traitor, had taken his own life. And Thomas, the twin, missed the occasion. When Thomas returns to the group, he refuses to believe them. He demands empirical proof submitted personally to his lordship: “Unless I put my finger in the nail marks in his hands and place my hand in his side, I will not believe.” This sound more like a pouting of a child than the words of an apostle. In justice, Jesus could have just said “enough.” Thomas had already seen so much. Acts 1 tells us that Judas was replaced by Matthias. This ungrateful skeptic could easily have been replaced as well. But Jesus does not deal with us by virtue of strict justice. God forbid! No, he comes to us in mercy, giving us what we do not deserve. And that’s how he dealt with this doubter. A week later, he gives him what he asked for. Imagine how badly Thomas yearned to eat his words as he put his hand into the sacred side of the New Adam. Thomas can’t be said to come to true “faith” in the resurrection through all this. Because faith is about believing what you can’t see. Walking by faith means NOT walking by sight. In heaven, we’ll see God face to face, so “faith” will be no more. Blessed, says Jesus, are those who have not seen, and yet believe. 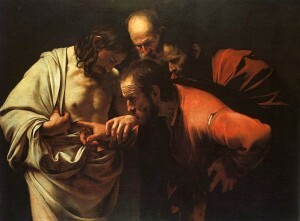 But Thomas does come to faith in something else that he can’t quite see. He saw Lazarus, the son of the widow of Nain plus the daughter of Jairus all raised from the dead. Thomas now looks at yet another risen human being before him and says what he did not say to the prior three: “My Lord and My God.” Thomas here professes what can only be seen by the eye of faith. The resurrection of Jesus is not just a marvel for Ripley’s Believe it or Not. Jesus is not just some first century Houdini. No, his resurrection is a sign that he is the Messiah, the King, even the Eternal God, come in the flesh. So this man, humbled by Christ’s mercy, is content to be known for all generations as “Doubting Thomas.” He and the other apostles spread a story in which they look real bad. And for it they receive not privilege but persecution and death.